Modular configuration. Supports piezo actuators, piezo-based tip/tilt platforms, and positioning systems with up to three motion axes. Amplifiers / power amplifiers for piezo actuators with up to 135 V, ±250 V or 1000 V operating voltage. Amplifiers with switchable power amplifiers are available for high dynamics. High linearity, also without position feedback, can be achieved with charge-control amplifiers. Amplifier modules are offered for one to three channels per module depending on the performance class. PI uses capacitive or strain sensors in its positioning systems according to accuracy requirements. The E-500 supports operation of up to three axes with single- to three-channel sensor modules. 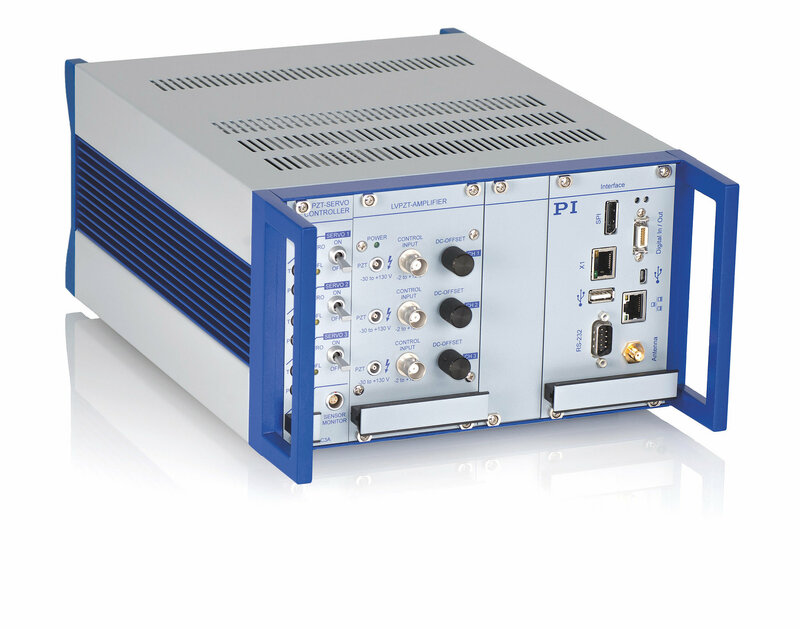 The flexibility of the E-500 system allows mixed operation with different single-channel amplifier or sensor modules. Control takes place either directly at the analog inputs of the amplifiers or via the interface module with digital interfaces for control via an external host.